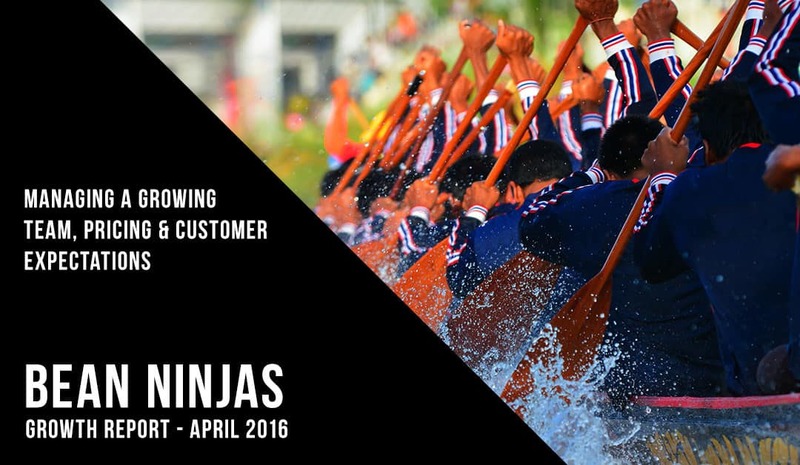 Our last ‘Bean Ninjas report’ was about hitting our first revenue target of $100k Annual Recurring Revenue in February 2016. Here are the highlights of the last two months. We go into more detail about these throughout the post. 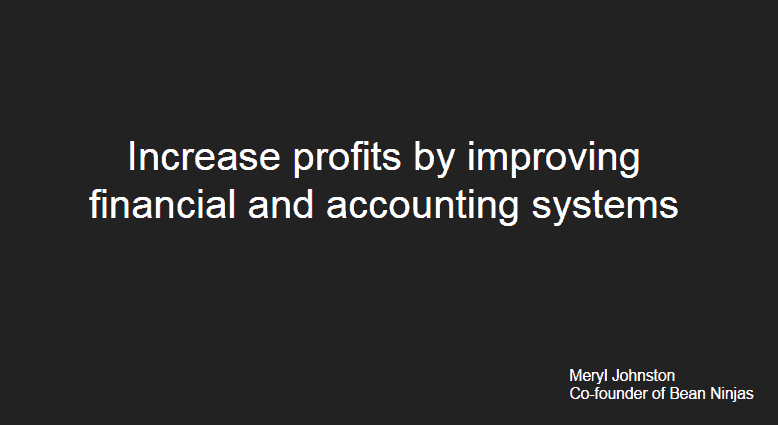 We presented on a webinar hosted by Mandi Ellefson from The Hands off CEO on the topic of ‘increasing profits by improving accounting systems’. Our blog post a Business Growth story – from $0-$100k received over 1,000 views which is our best performing blog post to date. We started an “Innovative Accountants and Bookkeepers” group with a focus on collaboration between the industries. We had the first meet-up during April and discussed key topics including value based pricing, building a team, practice management software and on-boarding new clients. So how are we tracking against our key metrics? 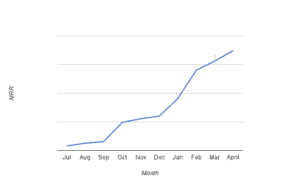 At 30 April, after our first 10 months in business, we had 53 customers and $10,500 of monthly recurring revenue (MRR). We experienced a slowdown in growth during March and April. This was a result of less marketing and sales activity during January and February when we went through a big growth period. Ben and I had to pitch in and help the bookkeeping team and we also went through a recruitment process to hire an additional 3 bookkeepers. In our first 8 months of business, we’d only had 1 customer leave. This changed during March and April where we had 3 customers leave. The common theme here was a mismatch between our service and the expectations of customers. We learnt something from each experience, but the key take-away for us was to improve the way we set expectations with a client in the initial stages of the sales process. Below are the stories around these 3 customers. This customer previously had an in-house bookkeeper who handled everything from opening mail, replying to emails and calling customers. We are significantly cheaper than an in-house bookkeeper, partly because we don’t provide any administrative support, just expert bookkeeping. This customer was frustrated by the perceived additional administrative workload between Bean Ninjas and an onsite bookkeeper. LESSON LEARNT: Define your scope. We needed to set expectations in advance about admin tasks being outside the scope of the Bean Ninjas service. TIP: We’ve found an in-house admin staff member / Virtual Assistant combined with Bean Ninjas is a great bookkeeping team structure. It can result in better quality bookkeeping and a more cost effective solution as you’re not paying expert bookkeeping rates for admin tasks. We want to work with businesses who love what we do, so we’re making a conscious effort to have these conversations upfront, especially if a potential client is used to working with an in-house bookkeeper. This customer had an internal accountant who was overworked, so they engaged Bean Ninjas to help with the bookkeeping. Once we set-up Xero a lot of the processing was automated, so bookkeeping took much less time. Ultimately this meant the internal accountant was able to complete the bookkeeping as part of her usual workload and they no longer needed Bean Ninjas. This was disappointing for us as we invested the time up front in implementing Xero and automating some of the accounting processes. It was good learning in terms of which clients will benefit the most from using our service and are the right fit. LESSON LEARNT: Determine what the real value of your product or service is to the client and how to best offer it. This experience started a conversation between Ben and I about how we charge for Xero setups and conversions. Customer 3: The complicated business. This customer’s bookkeeping was so complicated that Ben needed to do the majority of the work himself. We had a number of conversations with the client about how we could simplify the requirements. Ultimately it came down to the fact that their reporting requirements were set by a Head Office who was expecting enterprise level reports that needed accounting expertise (rather than bookkeeping expertise) to prepare. LESSON LEARNT: Stay focused and have clear boundaries between bookkeeping and accounting. We made a decision that this was not the direction we wanted to go in and this type of work was taking Ben away from growing our business. We had a conversation with the client and helped them to find a new bookkeeper. Value-based pricing is a hot topic in the accounting industry! I’ve been invited to speak as a guest panelist on this topic at an Institute of Certified Bookkeepers meeting in May. Value based pricing was a key discussion area during the first ‘Innovative Accountants and Bookkeepers’ meet-up held on the Gold Coast in April. Especially whether charging fixed fees is considered value based pricing or whether true value based pricing is varying the price for each customer based on what a customer is willing to pay. We’ll be publishing a more detailed blog post on this topic shortly. 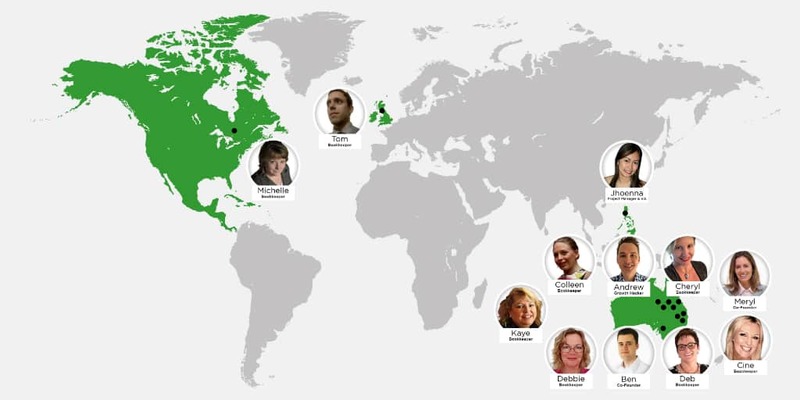 We started the Innovative Accountants and Bookkeepers group to encourage collaboration between bookkeepers and accountants around the world. You can find out more information here. Positive feedback from customers like the email below let us know we are on track with accurate work. We’ve been focusing on our response times, after having a disappointing result in February. I’m happy to say this has improved and we’ve been hitting our 24 hour response time target 97% of the time. 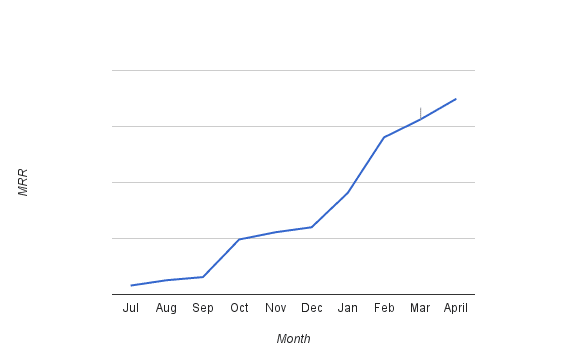 Our overall response time graphs in Helpscout are skewed, so I haven’t shared them here. When a customer hasn’t replied to one of our emails and one of our team members follows up again, for example 7 days later, Helpscout is treating this as a 7 day response time. This is skewing our overall results. We are now running response time reports by staff member and Ben has been discussing the results with each team member in his weekly 1-1 call. This is a great opportunity to focus on continuous improvement and training. Our focus has remained on online communities and content marketing. We have a lot of respect for Dan and Ian from TMBA and Dan Norris from 7 Day Startup, so it was exciting to be invited as a guest on their podcasts. We were asked some tricky questions which inspired plenty of thinking after each interview. Dan and Ian asked us about how we were going to build ourselves out of the hiring process. This created some great discussion in a mastermind group I’m part of around how much of the hiring process can a business owner delegate. Listen to our interview on Tropical MBA here. Dan Norris asked us whether we had considered getting investors. We hadn’t, but it sparked a discussion after the interview between Ben and I about what we would do if we had a $10k capital injection. 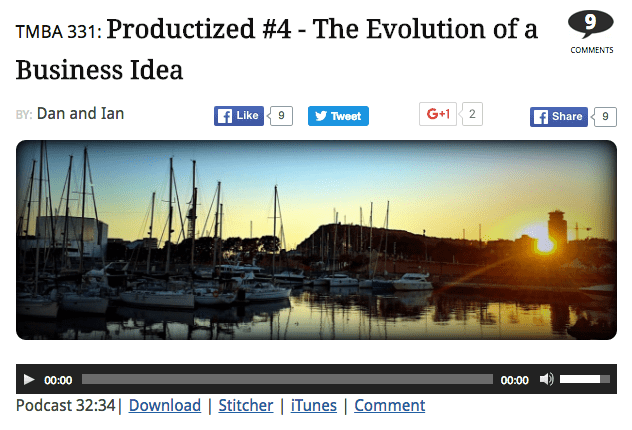 Listen to our interview on 7 Day Startup here. Coincidently, Justin McGill was weighing up the cost versus benefits of a business loan at the same time. You can check out his podcast interview on the topic here. 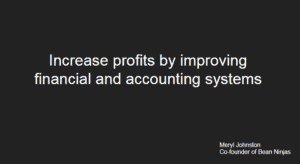 I presented on a webinar hosted by Mandi Ellefson from ‘The Hands Off CEO’ on the topic of ‘increasing profits by improving accounting systems’. We’ve been working with Mandi for a number of months and she is also a client of Bean Ninjas. The idea for the webinar came about as there was a common theme in the group coaching calls about business owners feeling uncertain about accounting and what they needed to know. 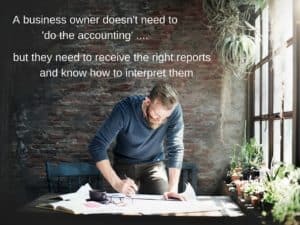 Understanding key accounting reports: Which ones are important and how to interpret them to make better business decisions. Looking at trends month to month. What it takes to get your accounting system working properly. Who do you need on your team and what should each person be doing. What you need to be tracking to know how much you are making so you can charge projects appropriately and stay profitable. This was my first webinar, so it was nice partnering with Mandi . We used GoToMeeting and Mandi had a great email sequence running from Infusionsoft in the lead up to the Webinar. We held a live webinar, so that it was more interactive and we could take questions from the audience. We’re planning some more Bean Ninjas webinars in the future, so stay tuned! The ability to put themselves in our customer’s shoes, understand what they are asking and then come up with solutions that give our customers what they want and save them time. They are motivated enough to work from home on their own and consistently do great work and hit deadlines. They are problem solvers and can logically work through a tricky scenario before asking for help. We didn’t have a set formula to find these qualities in our applicants. For example, we didn’t ask ‘please give me an example of customer service’. What we did do was have conversations with the applicants about specific situations in their work experience. We’d go into a lot of detail and from these conversations we’d get a sense of their attitude to communicating with customers and solving problems. We’re hoping that by drilling down into the characteristics of our top performers, we can find other similar great staff! You can check out a guest post on our blog about hiring here. Our recent focus has been on our hiring and on-boarding process for new team members. With our growing bookkeeping team we realised we needed a better system to on-board new staff. Ben previously did this through a series of on-boarding calls, but with so many new staff this was getting time-consuming. Instead, he created a series of videos to take our new staff through the key things they need to know. Our next project is to refine our customer on-boarding process and our sales process. So there you have it, our startup growth report for April 2016. What did you find most valuable or do you have any suggestions for our business moving forward? Comment below as we’d love to hear from you!